This includes hire of all the yurts for two nights, use of the camping paddock for up to 50 campers, the CL caravan site for use as a car park, the yurt marquee (and any other catering tent pitches etc. ), use of electrics and toilets for day guests for an event with up to 180 people on the site. 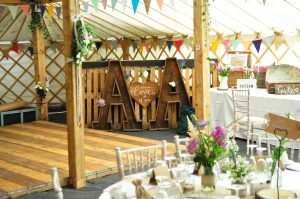 Under this option you only have access to the yurt marquee for one day, so set up, the event itself and clear up must take place on the same day. Prices start from £1,500, to include yurt accommodation for the weekend and use of the yurt marquee for the day of the event. This includes hire of all the yurts for two nights, use of the camping paddock for up to 50 campers, the CL caravan site for use as a car park, the yurt marquee (and any other catering tent pitches etc. ), use of electrics and toilets for day guests up to a total of 180 people on the site from 3pm Friday to 11am Sunday (so two nights accommodation). Prices start from £2,500. We have found a number of local providers who can make your weekend extra special. 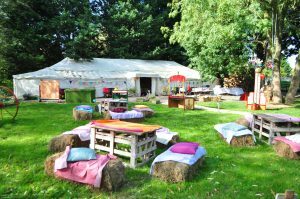 Visit our hen party page to see what we can offer and use our budget calculator to price up different options. If you click on the book now button below you will be taken to your booking calendar where you can check availability and book.